Selling your home? Check out this video for tips on how to stage your home! sales can be longer and more fraught than regular sales. property has been on the market a little while doesnʼt mean it will stay on the market. the way. If youʼre pursuing a home purchase in the near future, please get in touch. Not necessarily. Exceptionally high days on market could mean almost anything. Theseller could be bullheaded about their price. The seller may not be particularlymotivated to sell for emotional or other personal reasons. Donʼt forget: A sales-wearyseller isnʼt likely to respond to your host of rational reasons why their house should bea bargain. Banks, like entrenched sellers, donʼt always make decisions which seem rationalbased on obvious information. You can have a hard time divining the reason a bankchooses to reject an offer for a foreclosed or distressed property, and their decisionmay be based on financials which seem counterintuitive. The truth is, many distressedsales can be longer and more fraught than regular sales. Renters also share their perspectives on home buying; respondents sound off on the presidential race and its impact on the housing market. IRVINE, CA (Aug. 22, 2016) -- Berkshire Hathaway HomeServices, part of the HSF Affiliates LLC family of real estate brokerage franchise networks, today released results of its latest Homeowner Sentiment Survey indicating that current and prospective homeowners remain optimistic about the current state of the U.S. real estate market. Respondents cite higher home values, increasing housing inventory and low interest rates as the main reasons for their optimism. The survey showed that 66% of existing homeowners view the U.S. real estate market favorably, representing a 5-percentage point jump since spring to the highest level in more than a year. Favorability also grew most among baby boomers, who are making noise with a newly favorable attitude toward the housing market. To date, boomers have been the most pessimistic group tracked in the ongoing survey but the latest results reveal a full 60% of boomers view the housing market favorably, a 6-point increase since last spring. They overwhelmingly (72%) point to interest rates as the primary reason for their optimism. Among all respondents, millennials are most optimistic about the real estate market and are the most satisfied with the U.S. economy. In fact, 76% of respondents ages 18 to 34 view housing favorably, up a point from last spring and a full 17 percentage points from November. A large majority of millennials (85%) also believe that owning a home is an important part of the “American Dream,” a sentiment shared with older generations. Berkshire Hathaway HomeServices’ Homeowner Sentiment Survey also asked renters about their perspectives on homeownership. Many said they’ve been renting homes for longer periods than originally planned. Those renting for a year to three years said their largest challenge is saving money for a down payment. Prospective homeowners renting from three to five years said their primary hurdles include finding a suitable home, trying to save money and getting a good interest rate on a loan. Those renting for six years or more expressed more concern about the U.S. economy. Besides saving for a down payment, 37% of millennial renters indicated they are interested in buying only when they’re ready to afford their dream home, signaling that they find the concept of a “starter home” less desirable than previous generations. Renters who said they could not buy a home listed poor credit scores and strict lender guidelines as their principle hurdles. With presidential campaigns in high gear, the survey asked respondents which candidate would have a more positive impact on the housing market. Among current homeowners, 33% said Donald Trump would be better for real estate while 31% picked Hillary Clinton. Among prospective homeowners, 35% said Clinton would have a more positive impact on housing compared with 27% for Trump. Most Democrats and Republicans surveyed expressed a favorable outlook for the U.S. housing market. Regardless of political affiliation, respondents indicated that credit scores impacted by the recession, stricter lending requirements, and the competitive landscape for available homes are key challenges for the market. Interviews with 2,521 respondents were conducted online by Edelman Intelligence in June 2016. The respondents captured were either current homeowners (individuals who currently own a home as a primary residence) or prospective homeowners (individuals who do not currently own a home and are likely to buy a home as their primary residence in the next six months). The margin of error is +/-2.2% for current homeowners and +/- 4.4% for prospective homeowners. 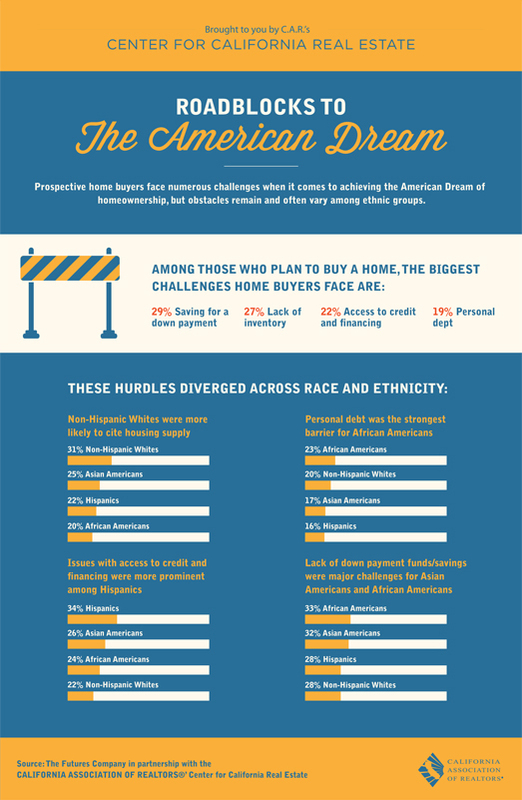 What is stopping prospective buyers from achieving the American Dream of home ownershp? There are many roadblocks buyers face including lack of inventory and personal debt. The Pine Street Promenade project is scheduled to break ground in 2016! The Pine Street Promenade Project was recently approved in Paso Robles. and a 5-level parking garage. the downtown park area of Paso Robles. community and draws to visitors. The project is scheduled to break ground as soon as 2016. The project includes a 121 room boutique hotel with meeting space, spa, andrestaurant; an open air artisan marketplace; a 500-seat performing arts centerand a 5-level parking garage. This village-within-a-village will also include retail space and offices. Itslocation in the town center makes it walking distance to restaurants,shopping & services. It will provide a commercial and pedestrian connectionbetween the city’s transit station and the central business district surroundingthe downtown park area of Paso Robles. The Promenade will be built in stages, with each stage bringing jobs to thecommunity and draws to visitors. Over 40 wine grape varietals and blends are produced in Paso Robles, California - from Spanish to Italian to Bordeaux and Rhône, including the area's heritage variety Zinfandel. Pleasant Valley Wine Trail, Downtown Wineries, 46 East Wineries and 46 West Wineries. Wine lovers can visit a large variety of tasting rooms, many of which offer picnic areas and specialty winemaker dinners. There are numerous wine events throughout the year, including the Zinfandel Festival, Earth Day Food and Wine Festival, Paso Robles Wine Festival, Sunset's SAVOR The Central Coast and Harvest Wine Weekend.